With an increasing prevalence of Diabetes, the number of patients with blockages in the blood vessels (specifically the arteries) is increasing. These patients typically come with leg complaints such as pain in the calf when walking, an ulcer that is not healing or some even with gangrene. What we have seen increasing in our practice is that patients are presenting with hand symptoms as well. One was a 63 year old lady who had diabetes and had a dialysis fistula in the arm and who came with severe pain in the hand. She underwent a DRIL procedure which allowed us to get rid of the pain as well as save the fistula for dialysis. 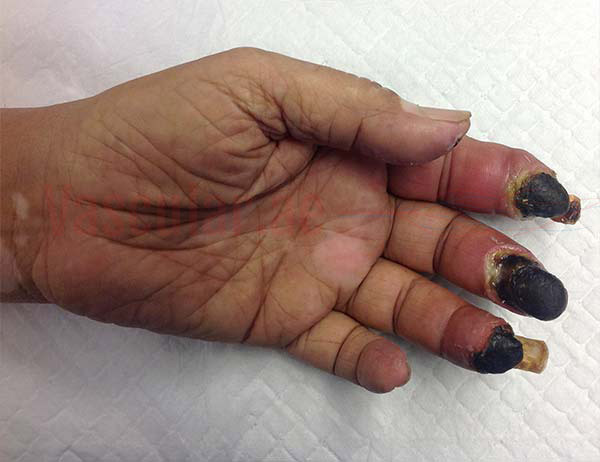 Another 60 year old patient presented with severe pain at rest in both hands and gangrene of the left hand (see picture). He had severe blockages in his arm blood vessels. 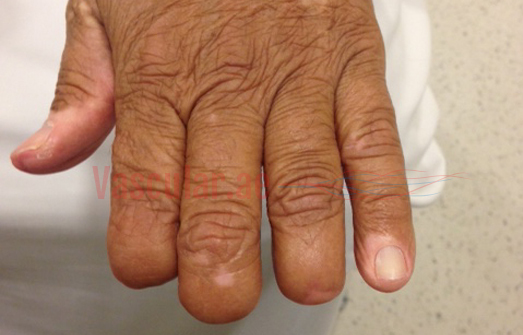 He underwent minimally invasive treatment (angioplasty) which immediately relieved his pain and has started the healing process for the gangrene in the hand, with the hope of stopping further loss of any part of the hand. The key to preventing such severe presentations and controlling things early is to see a vascular physician early as soon as you have a wound or even pain in the arm / leg which is not resolving. This is especially important in diabetics. The progress of the patient with the hand gangrene can be tracked on our “Current Cases” section.